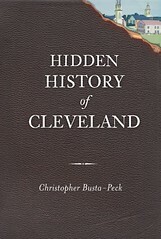 Cleveland Area History: Mystery Painting: Win a Signed Copy of Hidden History of Cleveland! I really want to believe that we have a winner - but I'm not completely sold on it. The shape of the bridge and its details are consistent with the painting. And the reddish building with the tower in the distance could well be the one see to the far right in this postcard. But the details on the Sanborn fire insurance maps don't quite add up. This page illustrates the best match that I've been able to find, on Lods, just to the right of the bridge. The artist would have been looking south. Here's a detail, rotated somewhat to include just the houses in question. I can believe that the two houses to the left in the painting are the ones to the right on the map detail. But the houses to the right - I'm not so sure. I know it's not in Cleveland, but I also think it is the North Hill Viaduct, which carried North Main Street. I think that the houses are on E Lods Street. Both the viaduct and the houses are no longer there. Seems the people in the pic are black, which would be consistent with the neighborhood under the viaduct in Akron at that point in time, it was right off of Howard which was Akron's black mecca at the time. Again though I'm pretty sure the houses immediately under there were destroyed in the flood about 15 years prior to the time frame this was supposed to have been painted. It's not Akron , They said Cleveland !! It looks to me like its the high level bridge in the Flats. Sorry i don't have a better name for that bridge nor the road it's on. 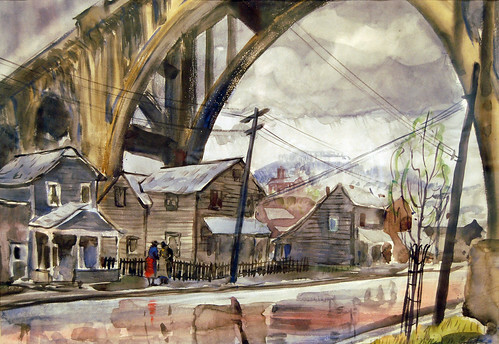 The watercolor is very similar to one that was in the exhibit "Watercolors from the Cleveland School of Art, 1936-1940" ,Western Reserve Historical Society Norton Gallery 2010. The WPA sponsored the depression era painting project. I have posted the other photo + unrelated one at URL listed. I'm sorry, as I was not as interested in local history at the time I snapped the photo of the paintings at my url, I neither noted title, year nor artist. However the artists were all associated with the Cleveland School of Art, and some well known. buckeye woodland area? down the hill in the hidden sections? I believe it to be the fulton rd bridge. this is my documented reference to compare.